A new correspondent has just sent me photographs of an Ottoman manuscript dated about 1509 1550. 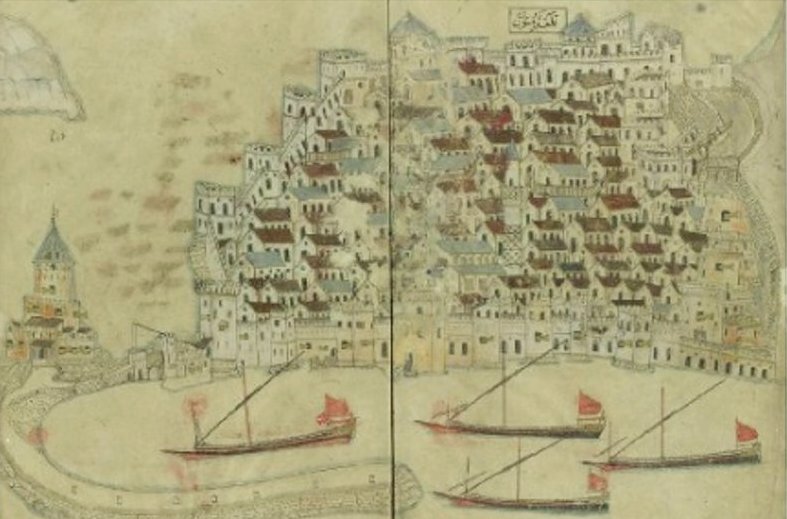 This image of Methoni -- captured from Venice by the Turks in 1500 -- is fascinating where the details are clear. It is accurate for the moat, the drawbridge, the mole, the cannon ports in the towers, the market place, and the bourdzi, but it shows a brighter, more prosperous, and more citified Methoni than any visitor ever described. It has strong walls with drawbridges at every gate which are four according to my reckoning . It is well furnished with towers, and on the towers and the walls there are large pieces of artillery . . . I entered the city where I did not see either houses or palaces worth of description; for its size it has many houses, and they are close together. I think there are few inhabitants, for in the finest and widest street there, the houses appeared to be shut up for the most part, and when I stood in the market place I did not see many people. Those I saw, besides that they are Greeks -- for they also belong to the Morea -- are thin and ugly to look at. The majority of their houses, whether they are large or small -- at least from the middle upwards and on the side facing the public streets -- are built of timbers. In short I did not see any other beauty there.
. . . 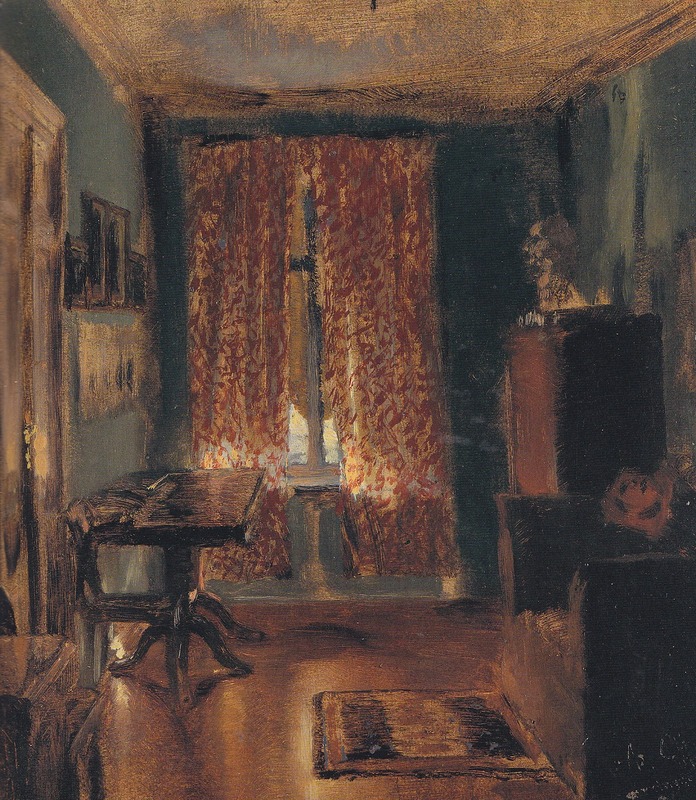 If I had waited even the sixth of an hour, the whole house would have been in flames, and consequently the adjoining houses: for this house was of wood, and very old, of the dryest kind of timbers and with party walls to similar houses in a congested narrow street. 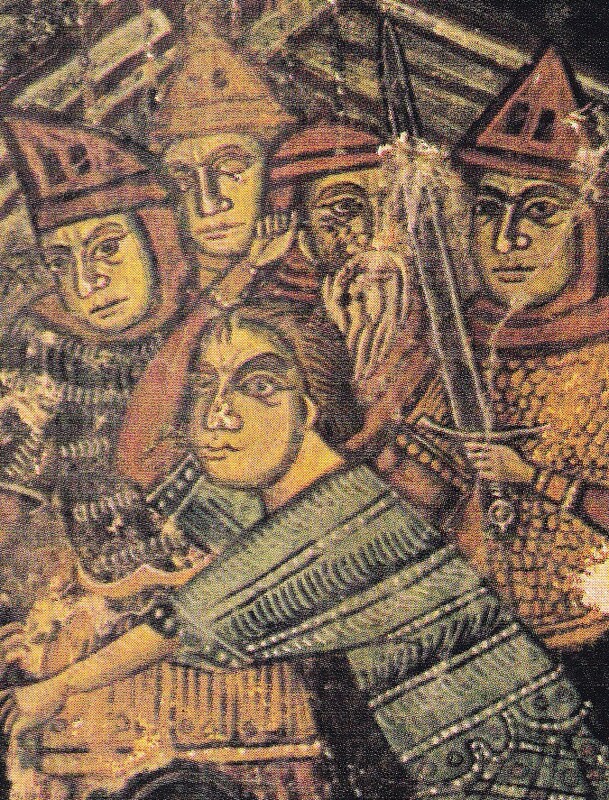 Casola did not see the city of this manuscript. 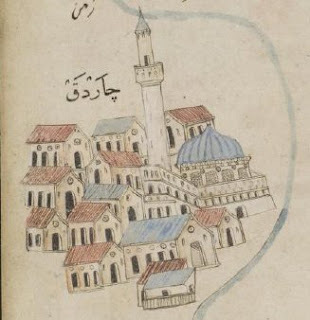 Nine years before this picture was presumably made, the city of wooden houses and dry timbers had been sacked and mostly burned in the Ottoman siege and assault, and it is unlikely that in nine years the Ottomans had rebuilt it in western-style architecture. I don't believe the painter of this picture had seen the city of this manuscript although he had certainly seen pictures of Methoni. 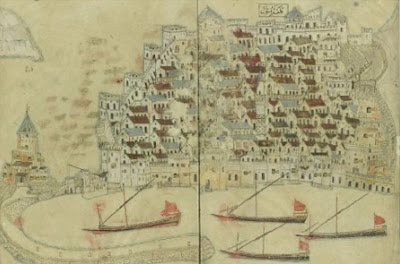 His Methoni is full of the kind of buildings Turkish manuscripts conventionally used to indicate western-style houses. who gave me good company and friendship. He showed me the strength of the town and the artillery, and it is in truth a small town but strong. . . . he took me around the innermost wall, which was very thick and built of rough stones: in addition there is a great rampart against the wall on which stood many fine cannon, great carthouns and slings. Casola, von Harff, and Felix Fabri and Bernard von Breydenbach (1483) wrote about churches in Methoni, with slight variations. I have no idea if I am seeing churches in the picture: as in the Koroni picture below, the Ottoman conventions for western houses look remarkably like the western conventions to indicate churches. (von Harff) . . . a Roman bishopric where the service is according to our use. Item: they have also built there a mother church of St. Leo, where he lies in person. There is also the head of St. Athanasius. (Fabri) I took my lords and some other pilgrims to the church of the Preaching Friars and there we heard High Mass . . . the Cathedral which is consecrated to St. John . . . in which is the body of St. Leo, a German pilgrim who died among the Turks and who was renowned among them for many miracles, the head of Athanasius, Bishop of Alexandria, and the two fingers of Sts. Cosmas and Damianus. (von Breydenbach) In the parish church named after St. John there are the body of St. Leo and the head of St. Athanasius the bishop. (Casola) The Cathedral can join the company of the other miserable churches, being badly kept in every way. . . .the relics were shown to us with a very poor light. We were shown the head of Saint Athanasius [of Alexandria] . . . and the body of Saint Leo. . . . he was a pilgrim who came from the Sepulchre and died on the galley, and was buried on the seashore. Afterwards he was revealed to the Bishop who caused him to be brought into the church where he worked many miracles . . . To tell the truth, the said body was kept in a wooden chest which was in a very bad condition. I do not mention the other churches, because I saw nothing there worth of remark. . . . The said convent [of St. Francis] has no cloister and no refectory; the dormitory consists of four rooms made of planks. 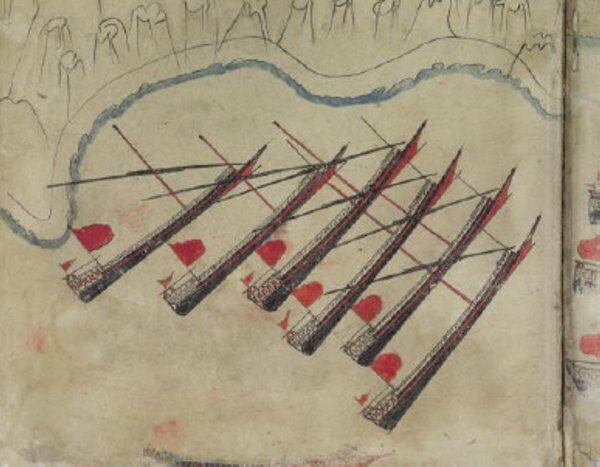 This manuscript portrays a dozen or so sites -- Koroni, Galata, Lipari, Nafpaktos, Rumeli Hisar, and some others, nearly all of them with these ships that look like geometric tugras. The image of Koroni, like that of Methoni, is not completely convincing as historical evidence, but it has this charming drunken cluster of western buildings and a mosque on the seashore. Kemal Paşa Zade, Tevâŕh-i Al-i Osmân, from whose manuscripts these images apparently derive, was an important Ottoman historian and astoundingly prolific writer, and you may read about him here. 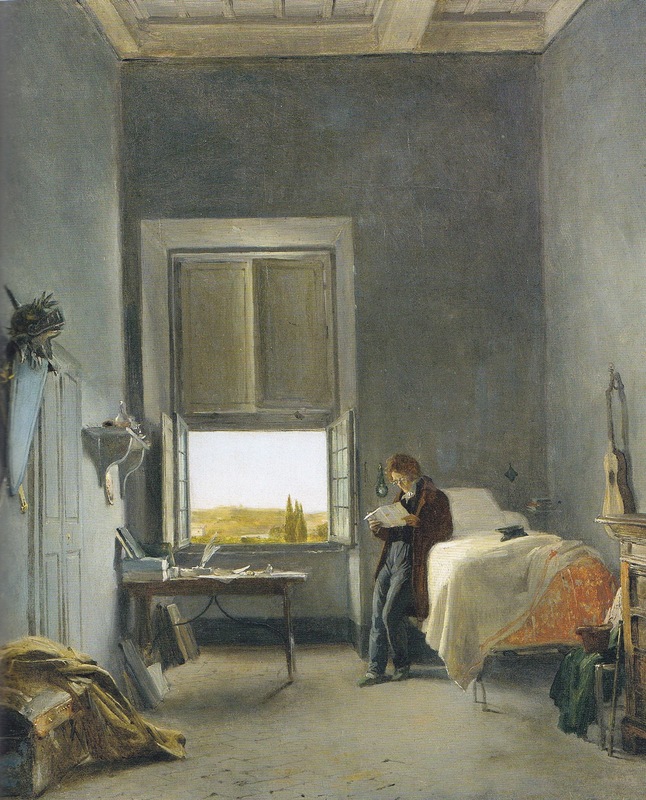 There is too little information about him in English for me to write with much confidence, nor am I sure that the historian was the painter of these pictures credited to him. The accounts in the Brill First Enclyclopedia of Islam, and in Babinger omit mention of the pictures at all when discussing his manuscripts, and I look forward to readers giving me more information. 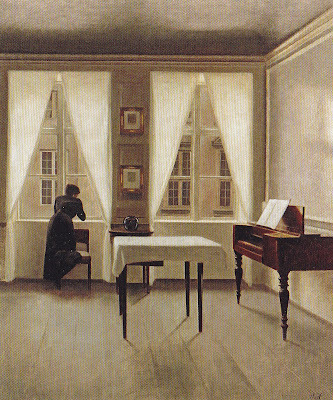 Kaïka, or Caïque, by Karl Krazeisen. The first part of this entry was published in November 2010: then I forgot about it. This continues with diary entries from Jonathan Miller who brought ships with humanitarian aid to Greece in the last year of the Epanastasis. The first entry gives a list of kinds of aid donated by Americans from the small nation of the United States of America, and some of the difficulties and tragedies Miller encountered. This entry presents other aspects of Miller's Greek experience. I delivered to Captain Stykos half a tierce of rice, one of beans, one barrel of flour, and one of bread. He is the famous Greek chief who first entered the Pallamedi at Napoli di Romania, when the Greeks stormed that place, . . . Stykos has a large family who have nothing to eat but herbs, he having been sick for the last three months. Went to see a black man [James Williams] from the United States, who had an arm and a leg broken in the engagement with the Turks in the Gulf of Lepanto. I gave him two dollars to enable him to pay off his nurse, and promised to move him to the hospital. . . . Took James Williams into my house. Williams came to Greece with Lord Cochrane, was cook of the Sauvieur, and conducted himself with great coolness . . . particularly at the battle in the Gulf of Lepanto, . . . for when no Greek could be found to take the helm, Williams volunteered his services, and was there struck down . . . he had before contended with the Turks, for he had lost a finger before Algiers . . . under Decatur. It is truly a novel sight in this part of the world to see the Grecian girls running around in their plaid gowns, made in the Frank fashion. . . . The garments sent without making, with thread and tape packed up in them, do great credit to the donors in America. My servant, who was with men when I was in Greece before . . . informed me to-day that he intended to marry before I left the country, that I might become, as the Greeks call it, his kombaros or sponsor. 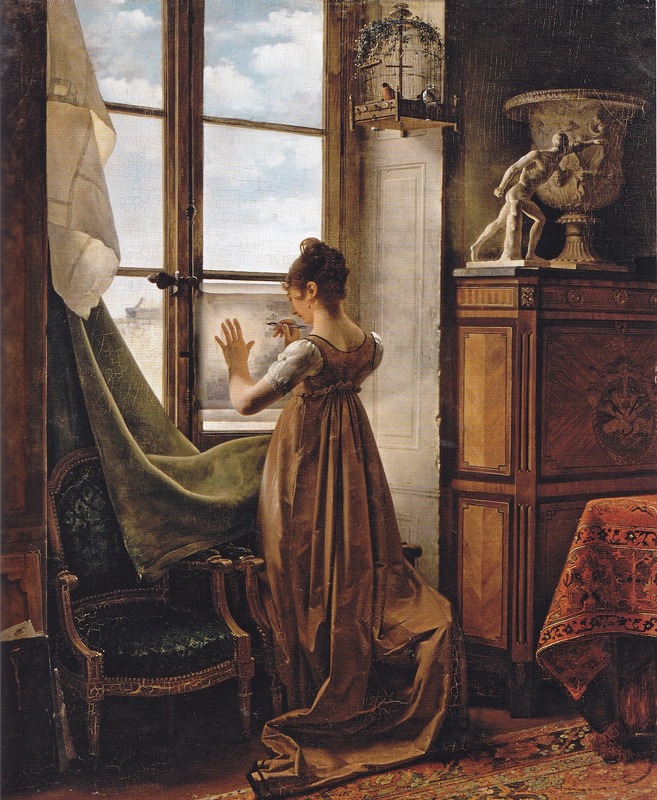 He has fixed his affections on a girl of eighteen, from Athens, whose name is Athena, and who is as beautiful as the rose when in its full bloom. Next Sunday week is appointed for the time of celebrating their nuptials. For the last three days I have been quite unwell, with a severe cold. The poor are daily, from morning to night, surrounding my quarters, crying out for food and clothing; . . . I had a catalogue of the poor widows, and orphans, and inform old men again made out, which amounted to three hundred and sixty three souls. Among these, I divided equally twenty-five barrels of Indian meal. Gave to a poor soldier who lost his leg under Kariskaki, before Athens, a barrel of Indian meal, and cloth to make him a suite of clothes. 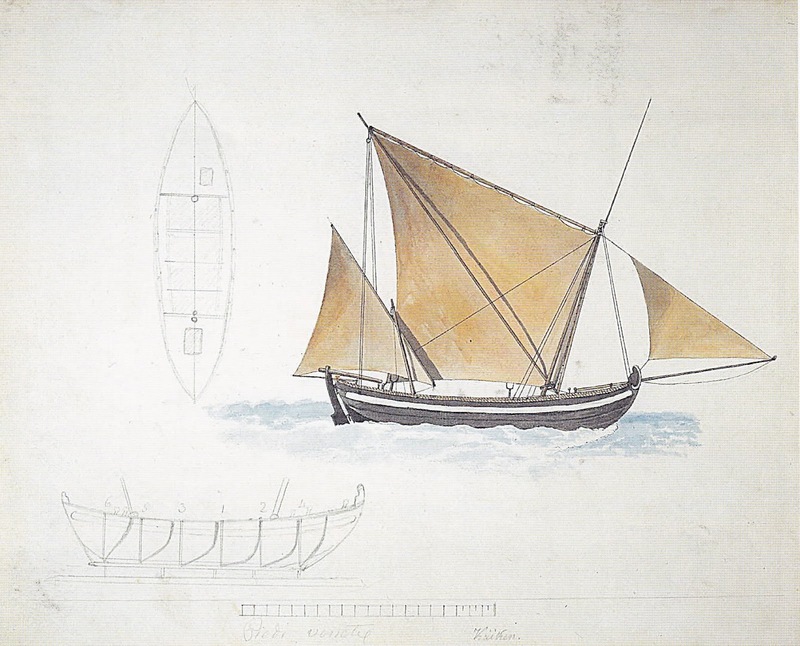 Delivered four barrels of Indian meal, to be distributed among twenty-one Greeks, who escaped from the Turkish fleet, when it was destroyed at Navarino. It is impossible to read Miller and not become angry at the "heroes" whose busts and statues litter the towns of the Morea. Capt. Hamilton observed, "If you should give to Petroni Bay to-morrow bread for the poor, I know well that he would sell it." Petroni Bay sent back the gift of flour I had sent him and said it was too little for him to accept. Petroni Bay called to receive my final answer, whether I would send the donations intended for Maina in his brig or not. I informed him that . . . I considered it a little less than a personal insult for him to press me to confide property to him . . . after I was satisfied that he had been employed in robbing an American vessel upon the high seas. I told him I had given information of the facts to the American squadron, and hoped to have the satisfaction of hearing in a few days that his vessel would be burnt. Given to General Grivas, commander of the Pallamidi at Napoli, to prevent violence, 133 barrels flour. Given to Fomares for the same reason, 143 barrels flour. Given to Commandant at Bourgi, ditto, 26 barrels. Seized by General Colocotroni, 55 barrels, Stolen by the soldiers, 11 barrels. About two o'clock in the afternoon, as we were standing in towards the shore of Maina, we saw the brig of Petroni Bay . . . standing for us . . . The pirate . . . put about in chase. We soon found that the piratical vessel was the best sailer and gained upon us . . .We kept on our course for about three hours, running before the wind directly out to see, when we had the satisfaction of seeing the pirate tack, and stand in for the land. Fourteen marriages were celebrated this day at Egina, in consequence of the news received yesterday of the destruction of the Turkish fleet. 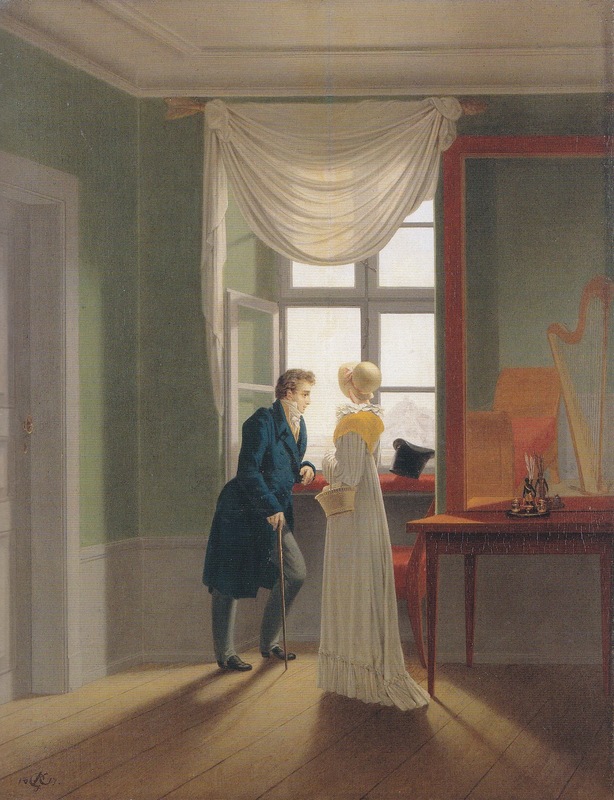 The parties had been betrothed for two or three years, but the miseries of the country had prevented consummation until now, when the prospect brightens. Watercolor view of the Morea from Nauplion by Karl Krazeisen. This entry is dedicated to Ersie Burke who recently sent me a photograph of a bust in Leonidion inscribed "Looter of Tripolis." I had not thought it was looting that was significant at Tripolis in 1821. Jonathan Miller's book, The Condition of Greece in 1827 and 1828; Being an Exposition of the Poverty, Distress, and Misery to Which the Inhabitants Have Been Reduced by the Destruction of Their Towns and Villages, and the Ravages of their Country by a Merciless Turkish Foe, can be downloaded from Google books. 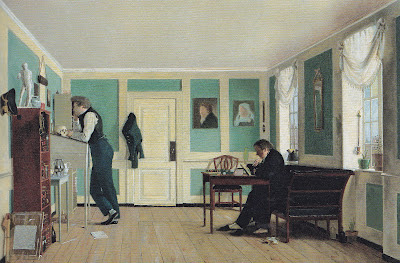 In April-July 2011, the Metropolitan Museum of Art had an exhibition of some seventy paintings, drawings, and watercolors, mostly by Romantic artists of the earlier 19th century. (This first picture is an exception.) 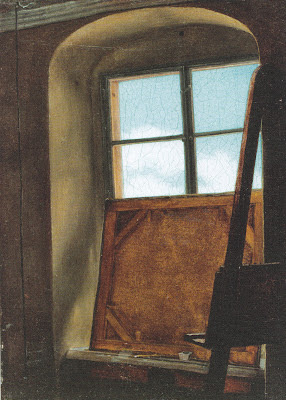 These are for the most part, small paintings whose main detail is a window. These are the kind of paintings you would want for your home, paintings of familiar things, sometimes slightly gossipy details of interior decoration and dress, often quite lyrical. 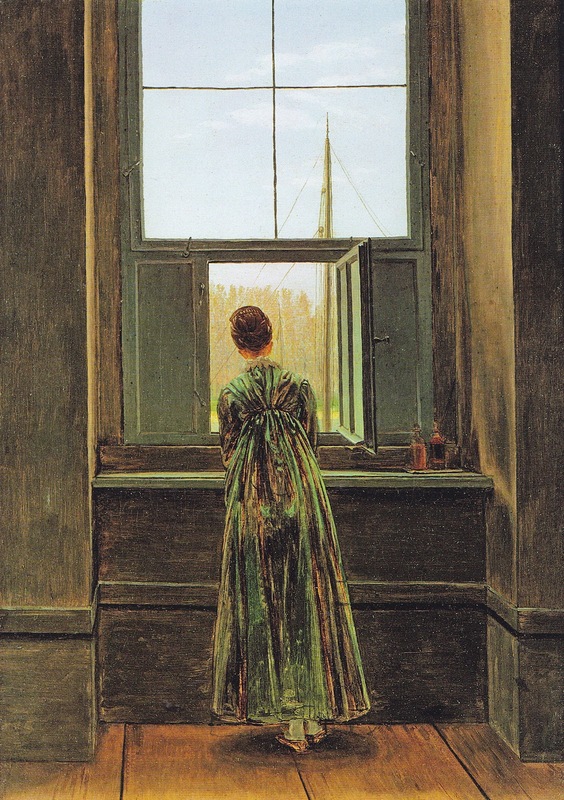 The window frame solves the problem of the focus of the painting, and the light, and often encourages the strong use of vertical lines, as in the folds of a woman's dress or curtains, or the legs of the furniture. The window frame also both narrows down the field of vision, and opens it up on the other side. 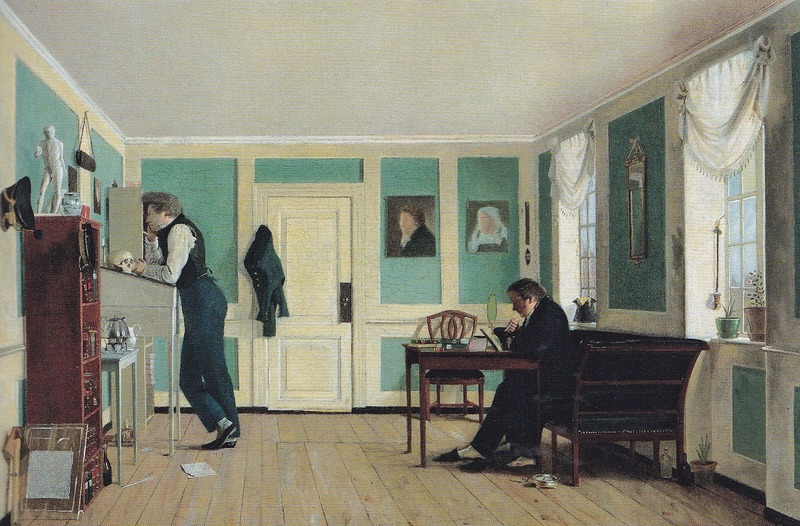 Great play is made of fine detail against the comparative barrenness of household rooms of the period and the multiplicity of rectangles to be found in a room: you can see artists discovering abstract painting. 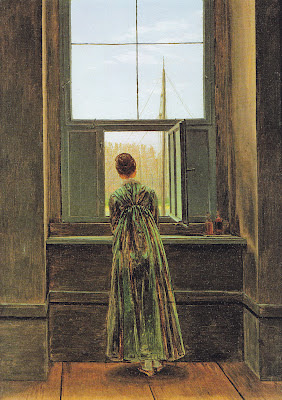 There are many variations on simple themes: a girl at a window, an artist at a window. Sometimes the artists play against the idea of windows and show them blocked. The artists explore shadows and reflections. None of these paintings is a profound statement about Man or Art or God or Society, but all of them with their muted colors show great tenderness and respect for the importance of the small things of our lives. 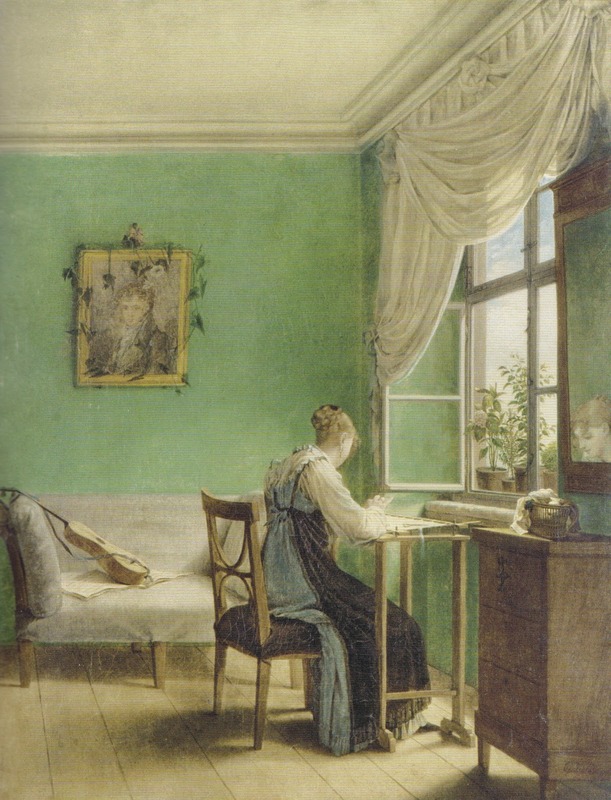 Martin Drolling, Girl Tracing a Drawing, early 19th C.
George Friedrich Kersting, Woman Embroidering, 1811. 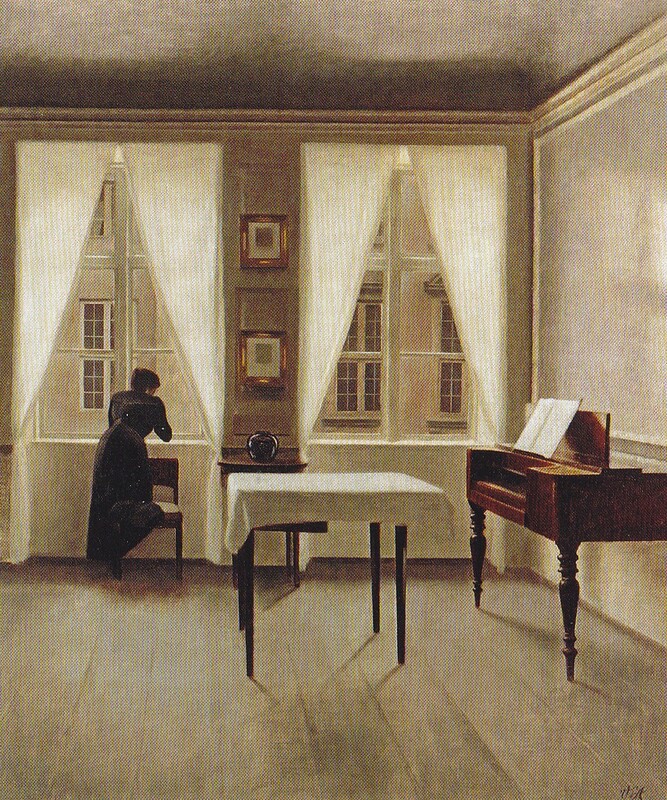 George Friedrich Kersting, Couple Standing at the Window, 1817. 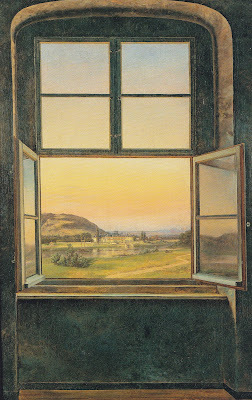 Johann Christian Dahl, View of Pillnitz Castle, 1823. 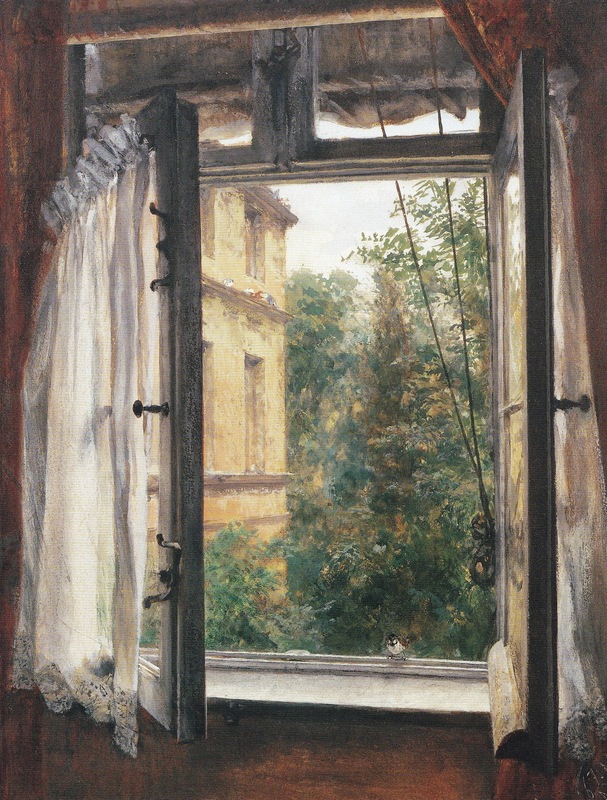 Adolph Menzel, View from a Window in Marienstrasse, 1867. 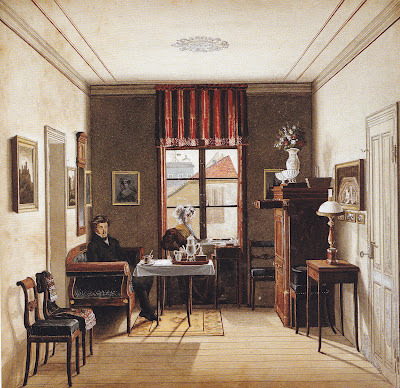 Wilhelm Bendz, Interior from Amaliegade with the Artist's Brothers, ca. 1829. 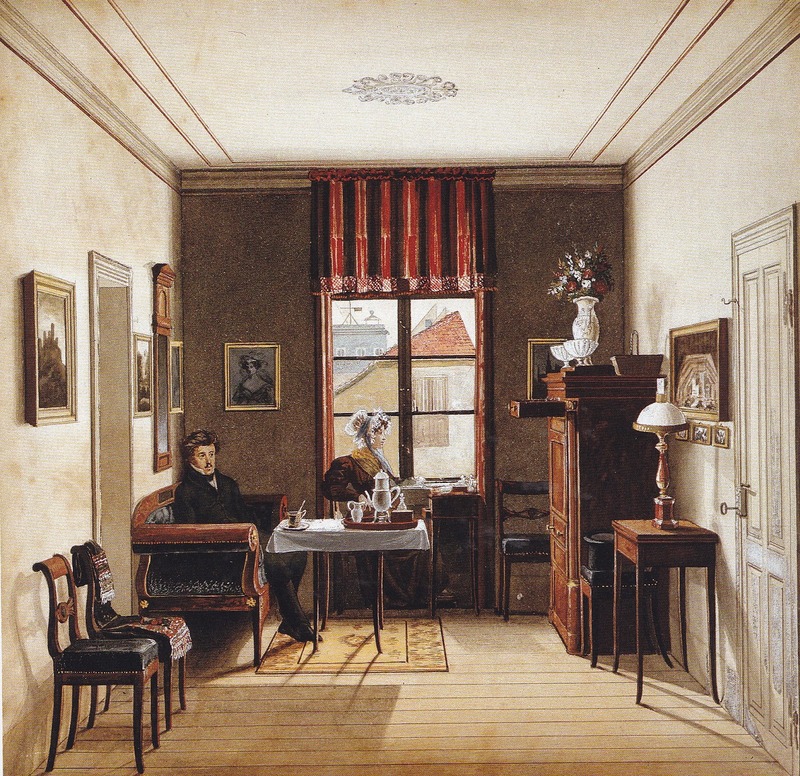 Carl Wilhelm Gropius, Sitting Room, ca. 1830. 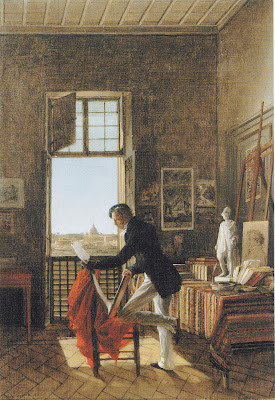 Jean Alaux, Picot in His Studio at the Villa Medici, 1817. 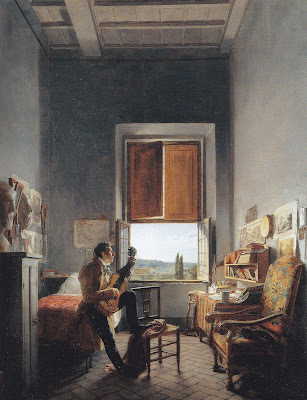 Leon Cogniet, The Artist in His Room at the Villa Medici, 1817. Anton Dieffenbach, Window in Sunlight, 1856. Adolph Menzel, The Artist's Sitting Room in Ritterstrasse, 1851. 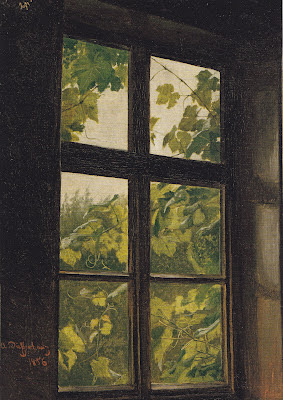 Carl Gustav Carus, Studio Window, 1823-4. 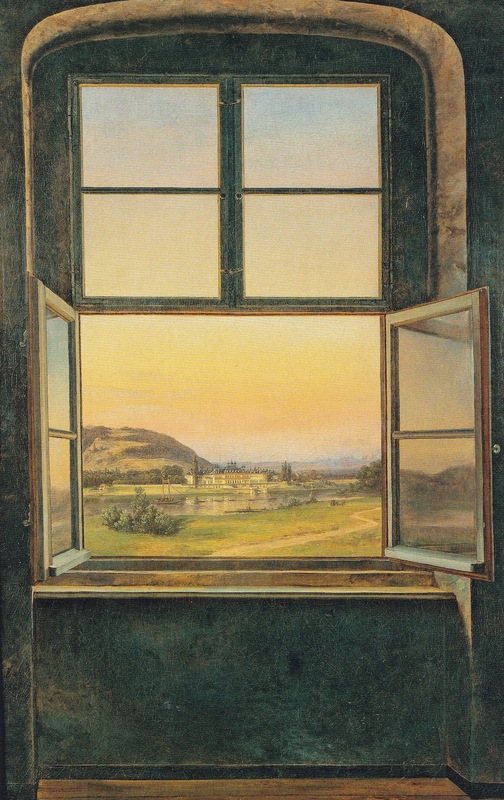 The pictures here are scanned from the MMA catalog, Rooms With A View: The Open Window in the 19th Century (Yale University Press, New Haven and London, 2011). 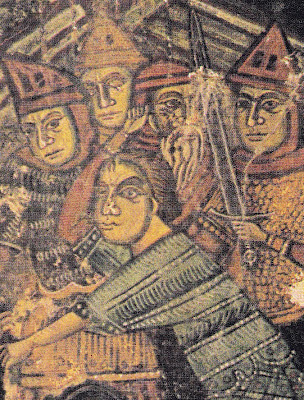 Soldiers in the Panagia, at Skafi-Prodromi, Crete. When Piero Brunoro of San Vidal died in Negroponte in 1461, his company of 42 chavalli and 500 fanti had to be dispersed. Some were merged into other companies, some were discharged. The records of the fanti and stratioti discharged -- 176 of them, a few noted as morto or fuzì -- give a remarkable sense of the international quality of these military companies and, more important, an impression of what these men looked like. They come from all over Italy, Greece and the islands, the Balkans, and across Europe. The injuries and scars are striking, and the descriptions, overall, reflect difficult lives. - Batista da Padoa, de Antonio; short, black eyes, pale, broken nose, scar on right temple. - Rugier de Burgos, de Diego; ruddy complexion, tall, smallpox scars, 38. - Zuan de Petra Santa, de Nicollo; young, pale grey eyes, scar between eyebrows. - Piero del’Arta, de Nicollo; 34, short, mole under the ear; caporal. - Stefano de Bosnia, de Zorzi; 32; black eyes; wart under right eye. - Zuan de Belgrado, de Mirislan; blond, pale grey eyes; scar under left eye; 30. - Zan da Modon, condan * Zorzi; young; short; thin; little beard; scar on right side under lower lip. - Cazavillan da Zara, condam Lucha; 34; thin; red; scar on right forehead. - Andrea dele Spezie, di Bertino; scars around eyebrows over nose; servant of Piero Venier. - Stefano de Narenta, de Zorzi; pale; thin; short; black eyes; servant of Marioto. - Nicollo da Corfù, de Piero; young, smallpox scars; brown hair; scar on forehead; servant of Greguol da Padua. - Zuan de Salonikchi, condan Xeno; 18; brown hair; pale grey eyes; hand covered with scars; servant of Piero da Vinexia. - Piero Frezer de Napoli di Romania, condan Marco; 36; thin; scar in middle of forehead. - Piero del'Arta, de Nicollo; anni 34; basso; ja. mora soto l'arechia; caporal. - Rugier de Burgos, di Diego; rosso, longo, varoloso; anni 38. - Dimitri Canessi, enrolled in place of Martino Marcho (discharged). - Georgi Zanrandino, entolled in place of Laxaro Marcho (discharged). Thirty-one men are listed in Gini Canessi's company. They remained in Negroponte for nearly nine years. Twenty-six of Gini Canessi's relatives were killed in Negroponte's defense. The next year he was at Nauplion, leading a band of 25, continuing the war. He was to have a provision of 5 ducats a month (which meant 50 a year, quite decent if actually paid) and was given a present of 25 lire, about 10 ducats. * condam = quondam = "son of the late" . . .. This material is taken from C. Capizzi, "Un documento ineditor sulla guarnigione veneziana di Negroponte," Rivista di Studi Byzantini e Neoellenici 12-13 (1975-1976) 35-108.